Reflections from A to Z | True story. Really. This entry was posted in Challenges, Tools and tips and tagged #atozchallenge, #campnanowrimo. Bookmark the permalink. Excellent report. 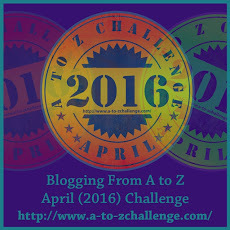 Yes, the A to Z is as easy as ABC–or I guess we can change that to “A to Z”. You took the right approach for you first Challenge and learned some good lessons. Thanks for sharing your experience with others. Thanks for visiting! I’m so glad I did it, and the reflections post was a really good opportunity for me to gather my thoughts – something I might not have done without prompting. I enjoyed finding your blog and liked the poetry and the Spanish, as I am always trying to improve my español tambien. I hope to have more posts pre-written next year but doubt I will because it will be too tempting to post them right away. Always seems like a good idea though. I had grand notions of doing Camp NaNo in April as well, but came to my senses. You mention keeping track of attributions and source materials. I used to just bookmark them and try to keep them somewhat organized using nesting folders. But you should see my bookmarks – they are totally out of control and almost useless. I switched over to Evernote and that is much better for me, mainly because it’s easily searchable. Bookmarks never worked for me, either. I tend to store everything in one place – text, links, etc. – in files on my computer, but maybe I should check out Evernote. Thanks for the visit and the comment – and the retweet! I completely understand. It sounds like you wound up doing pretty well, though. I enjoyed reading your reflections post, too. Some very interesting insights, and I loved the list of blogs you visited and liked. Thanks for visiting and commenting! I think the one year I did nano, AtoZ and camp nano I did the June version not April. I don’t think I could cope with doing camp nano and AtoZ in the same month unless I prescheduled early and didn’t visit so much. Great to see a number of nanoers doing this one too. Well done and good reflections. Thanks very much. I do love my challenges – outside deadlines always tend to carry more weight with me for some reason, but two in one month is definitely a bit much. One every other month, on the other hand, might be just what I need to keep me on task.Thanks for visiting and commenting – and I’ve enjoyed looking at your fruit and vegetable sketches!